My traditional 7am Saturday coffee catch up with my good mate Henty was at B Shed in Fremantle Port this morning, and did I need two double Espressos badly after a sleepless night. 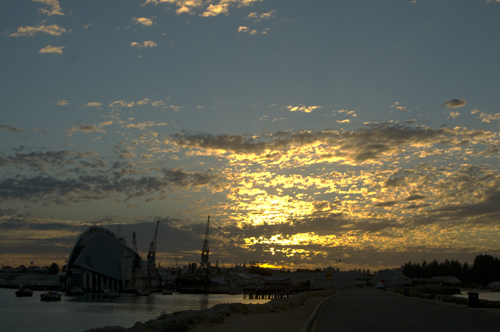 I love early mornings and the many stunning sunrises we get here in Fremantle, so took this photo toward C Shed, where unusually the Leeuwin II was at berth. Only 37 passengers had booked the early Rottnest Express ferry trip to quokka island and that is no surprise with the wet and stormy forecast for the weekend. Summer is back! 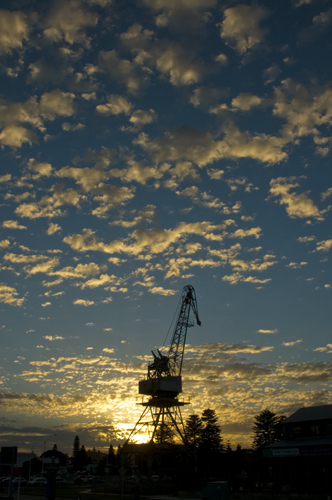 We are expecting 31 degrees today in Fremantle, so get out the shorts, mini skirts and bathers! The sunrise over the Maritime Museum was stunning and the warm colours a prediction of what the day will be like. It was very busy at B Shed with many people sailing out to Rottnest Island. I believe it is going to be the hottest May in 58 years or so, according to the weather news on TV. Enjoy it! It was a pretty wet and cold morning in Fremantle still this Sunday but spring is only days away, so I hope my terrible cold will disappear when warmer weather arrives. Took this photo of High Street just after 7 am. It was a rather crisp start of winter this morning but the early sun light always creates some magic for photographers, as these photos taken in Fleet Street and of the arrival of the cruise ship Pacific Eden show. Nice to be invigorated by a beautiful sunrise after a sleepless night. I love the crisp early mornings and the sense of tranquility in Fremantle when only a handful of people are out on the street.